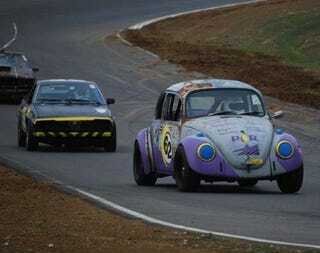 Since we all care more about the Index Of Effluency than we do about the overall winner, I'm going to take advantage of my very limited internet access to share the IOE winner with you: Purple Lemon Racing's 1969 Beetle! That's not to take away from the accomplishment of Pandamonium Racing's BMW E30; I'll post about their overall win once I'm back to civilization. Now I"m going to pack up the Crown Vic and head south 130 miles. Check in later for more LeMons Arse Freeze roundups!